'I run a website called Jean Stories—Florence [Kane] and I came up with the idea because nobody was really talking about denim for women online. There were a lot of sites about guy's denim in really heady, nerdy, technical detail—odes to men's selvedge and raw denim. But there wasn't a really emotional website talking to women about jeans. And everybody wears them. And most people have a favorite pair. And most people have worn those favorite pairs during particular points in their life. So I just saw it as a good starting point for me, because I also wanted to learn more about denim. My parents own stores in LA and I started working behind the denim bar when I was 19. And at one point Bruce Springsteen walked into the store and he was wearing the most amazing pair of jeans you've ever seen. They were perfect on him. And they were old Levi's that you could tell he'd had forever. And they were just magnificent. And I thought at that moment, God, that'd be so cool to do like a coffee table book about people and their jeans, like I bet those jeans have seen some amazing things. And I would love to talk to Bruce Springsteen about his jeans. You can spark a conversation with anybody about it. I’ll try anything, especially with denim. I don’t care where it’s from or what brand it is, I’m going to wear it for a day and see how the fabric fits, see how like the jean gives or expands or moves. For me, it’s about knowing the market. I probably have about 100 pairs at this point—there are piles of them everywhere. Basically I get up and get into jeans. Then I take them off and go to bed. I’m not a denim snob, though. When I talk to people about what jeans they wear, they’ll get intimidated, like there’s a right or wrong answer. There isn’t. It’s whatever works for you. One of Florence’s favorite pairs are American Eagle. One of my favorites is J Brand. We’re equal opportunity denim people. Recently, I became the style director of Travel + Leisure, too. Travel magazines are changing so much right now so it’s interesting to explore what fashion and style look like as the world gets smaller and we travel more places. Just like you learn a lot about a person by looking at what jeans they wear, you can do the same with what people travel with and what beauty products they bring and what souvenirs they come back with. Personally, I love the Toile de Soleil bags for beauty and travel. They’re cotton, they fold up nice, and they’re not too expensive, so those are my favorite. Plus, I travel pretty light beauty-wise, so everything I need will fit in one bag. My packing strategy is not so different from how I live every day. My palette is always blue, black, white, navy. There’s no real color coordination that has to happen. And I never pack something that I haven’t worn in the last six months. If it hasn’t worked for me recently, it’s probably not going to work for me when I find myself in a less than familiar environment. Jeans are obviously good because they don’t really wrinkle and you don’t have to wash them. The one thing that I have to do when I’m on a plane is wash my face. I just can’t have makeup on because then I feel like I can’t go and refresh in the middle of a flight. So I’m always that annoying person on the redeye who’s in the bathroom for a long time and you have no idea what they’re doing. [Laughs] I’m just in there, washing my face! Because my schedule is different every day, having a beauty routine is kind of impossible. I’ll put on makeup on days when I have appointments, but if I’m working from home, I won’t and will just reapply moisturizer throughout the day to refresh. It’s kind of a luxury to work from home and take advantage of giving my skin my nutrients and a break from makeup. My morning usually starts with a face oil of some kind. I love the Éminence Calendula Face Oil. And then, you know, maybe around like lunchtime I'll like reapply some moisture. I just got Kiehl’s Hydro-Plumping Re-Texturizing Serum Concentrate and I really like it. Or I’ll put the Caudalíe Vinosource Overnight Recovery Oil all over—neck, face, hands, whatever's left, I, like, rub it on my arms, I love it. Éminence makes a Vitamin C and E serum with kale and citrus. 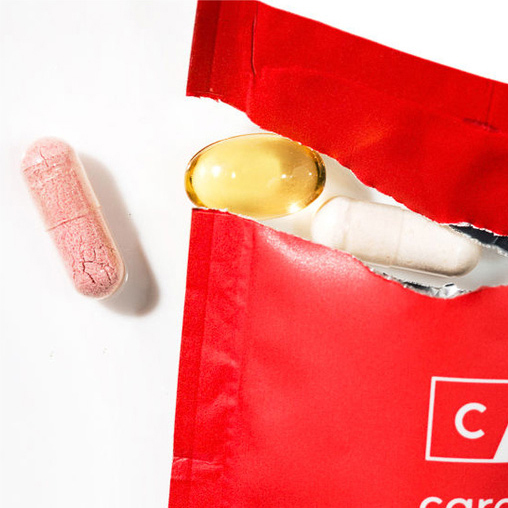 Those vitamins are excellent and keep me from breaking out. 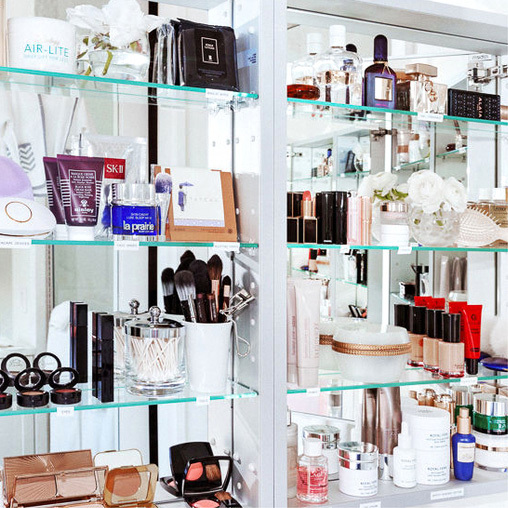 I’ve found a lot of my main products through the Vogue beauty closet, but my favorite way to discover things is if I get a really good facial or massage, I’ll buy those products. I had the most amazing facial ever at the Montage Hotel in LA and that’s how I discovered Éminence. I’ve been loyal ever since. Their spa is just wonderful. After your treatment, there’s a magnesium bath you can just hang out in and feel amazing. And then you can go have dinner at Bouchon and eat French fries and drink wine. Really, really nice. About a year ago, I had a makeup artist do my makeup for a shoot and she put gold eyeliner under my eyes. And ever since then, if I’m going out and putting my face on, I use MAC Eye Kohl in Powersurge under my eyes. I’m wearing it right now actually. It’s very subtle and just picks up some of the gold flecks in my eyes. And gold feels like more of a neutral for me. And that makes me feel like I don’t need anything else. Sometimes I’ll highlight—I learned how to do that from Alice Lane. Tom Ford has a really good compact for it, but even using Aquaphor on your face where the light hits it will make you look dewey. I love putting the RMS Living Luminizer under my eyes to brighten everything. My mom always wore clear mascara, so I often just use the clear Maybelline Great Lash on my lashes and eyebrows. If I want real mascara, then I like the Clinique Naturally Glossy—I’ve been using it since high school. I thought it was really cool to buy at the mall. It comes in a silver tube. I still think it’s so chic. Their powder is really good, too, though I don’t wear a lot of powder. I still have a really old compact of it. It’s old school. Right now I’m using a clear lip balm I got as a freebie at some hotel. But I also like all the colorful ones from Fresh. I never lose my lip balms—it’s sort of a curse because you end up amassing millions. When I was younger, my dad would always bring back Labello balms from Europe and I’d use them all the way down. I loved those. My hair's extraordinarily long for me right now. I had like boy short hair a couple years ago. I’ve been putting it up into a ponytail a lot, but I also just learned to braid. I’ve been going to Jordan M at Bumble and bumble for the last decade or so. Last time I saw him, he braided it and I decided I had to learn. I spent all of Labor Day weekend practicing it. So it’s new territory for me and kind of exciting. It’s cute after it falls apart a bit but you still have some hold. I use Frederic Fekkai Shampoo and Conditioner—I really think it makes a difference, actually. I used to be kind of cheap when it came to shampoo, I would just use whatever came along. But, now I think shampoo is worth investing in. I’ll put a drop of the Leonor Greyl Regeneresence Naturelle Oil in which is amazing and smells like Camellia. Then, I'd do Bumble and bumble Brilliantine—a little goes a long way. I had a routine, but with this length, I’m figuring it out again. Now that I’m pulling it back, it needs more hold. I started using this Paul Mitchell Soft Sculpting Spray Gel, which I used to use when I was a dancer. You just spray it, so your hands don’t get dirty. Then it holds for forever. My one thing is that I shave my legs every day. I’m very dedicated to it because I don’t like the feeling of stubble at all. I use the big Venus with the moisture pads on it. Then I’ll put Neutrogena Body Oil all over. My favorite deodorant is the Fresh Sugar Roll On. It’s still got aluminum in it, so it’s probably terrible for you. But I’ve been using it for more than a decade. I like to paint to paint my toes red, but I never wear polish on my fingers. Not ever. I’ll put clear polish on if it’s a special occasion—like for my wedding—but that’s it. My cuticles are better when I don’t touch them. I love the Uka Cuticle Oil. I'm obsessed. And I like the smell of it so much I use it as perfume. It smells like a Japanese spa, just so relaxing. I carry two of them with me. My family does business in Japan and the people that work with my dad gave me all these amazing Japanese incense for my wedding. It was a beautiful gift. I don’t burn them because I like how they smell as they are. I keep sticks in my sweaters and with my makeup and it just scents everything. But other than that, I don’t wear perfume or anything. Jane Bishop photographed by Tom Newton.